Last Fall, after an article about me hiking East Bay trails in a chair appeared in the Contra Costa and Valley Times, I received a very nice card from a teacher in Pleasanton, CA. Ms. Aderman let me know her class had voted me "Most Inspirational", and would I please e - mail her to let her know if I could find time to visit her class? How does one resist an invitation like that? We e - mailed a couple of times but unfortunately lost touch. It was one of my bummer moments of 2006, that I hadn't taken time to drive by the school and see this thoughful educator who had extended such a gracious invitation. I had forgotten about Ms. A's class until a few weeks ago, when I was at REI with the inaugural White Mountain slide show. After I finished, Ms. A and Ms. F, a parent and classroom aide at the school, introduced themselves and told me I wasn't getting off so easy this time. They were there to pin me down to a date where I could meet with a group of precocious 2nd graders. Who says opportunity knocks only once? Here was my chance to work a room full of people with whom I can REALLY identify! Are you kiddin' me? Of course I accepted. And within days, we'd decided that December 4th at 9 o' clock I would visit Ms. A's class. So much for that! I might as well have left the talking bullets in the car. The class knew me by name. They were the First graders of last year who'd voted me "Most Inspirational". They were as excited as I to have me there, and immediately, relentlessly the questions flowed. For an hour I answered questions - how did you get in the wheelchair? How do you stop when you're going downhill? How hard is it to go uphill? What's the scariest animal you've ever run across on a trail? (a skunk, I told them without flinching) And like a White House press conference, each question had a follow up. These kids were so smart, so thoughtful and caring. There wasn't an ounce of reservation on the part of a single child - as quickly as they could blurt them out the questions kept coming. This, as far as I was concerned, is as good as it gets. We took the above photo just before I left, and after they presented me with (mmmmmm!) a nice basket of chocolate goodies. Just after, three members of the class stood to give me their feedback: "I appreciate that you came here today to tell us how you hike in a wheelchair." " I appreciate that you see so many animals." I was so touched that I barely escaped before the kids could see me tearing up. To paraphrase an old song of Herman's Hermits - "Ms. A, You've Got Some Lovely Students." 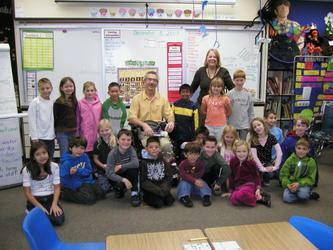 I hope to get out even more soon and visit more classrooms, more kids like Ms. A's class. It's clear she has instilled in them respect for people of all abilities as well as a love for all things outdoors. I bet this class is representative of the future. If I'm right, and it is, we're in good hands!